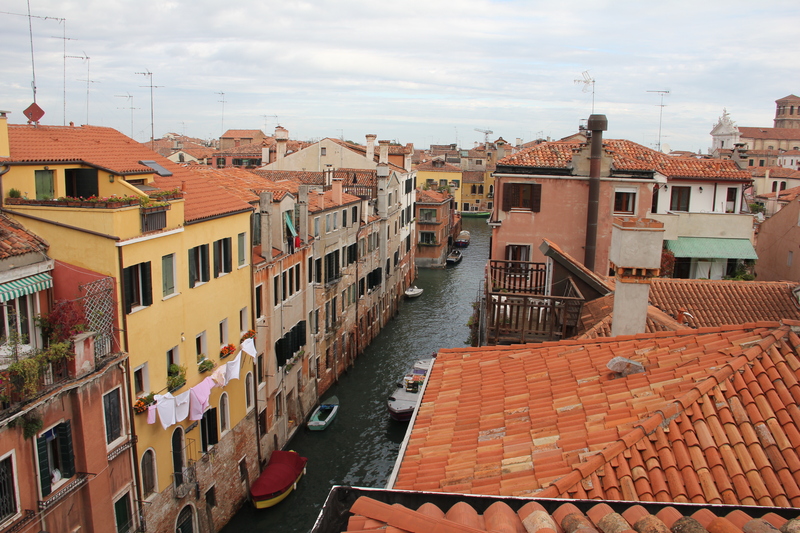 This weekend I returned to Venice for the first time since 2002. 10 years gone. There is always a risk returning to a place you once loved and adored, a fear that you could ruin the magic and distort the original memory — like Wordsworth’s “Tintern Abbey” – the memory may compete with the current image in your mind’s eye. Check out images from my first trip to Venice, featuring the 21-year-old me who inspired my current life. This is for you, kiddo! Stay fun! A little over 10 years ago, I strapped on an overloaded backpack after college graduation, and popped all around Europe, booking hostels on the Internet and changing plans as I went. I originally booked two days in Venice, but fell so in love that I had to completely rearrange the rest of the trip, just for one more night. I heard false rumors of the stench, dirty water, and decaying buildings — but instead found clean(ish) blue water, no noticeable scent, and buildings that were in charming states of renovation – preserving the beautiful architecture — architecture unlike any I’ve encountered in my travels since. The trip was magical, and the city was hard to leave after just three short nights. On to the Tuscan countryside and a new group of friends, sights and experiences. But I always savored the images, still not believing I was there. All my trips to Europe since then, I have not returned. Now that it’s about 4 hours from my new home in Genoa, it’s a weekend trip for me. 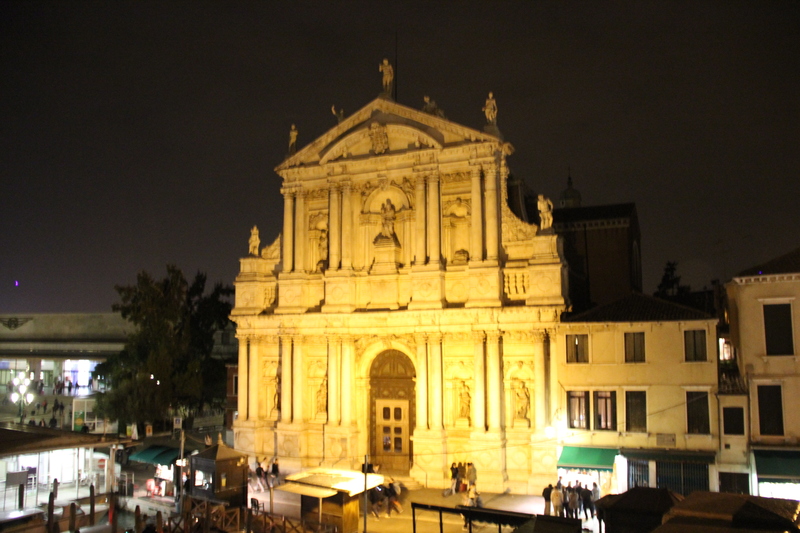 It was Dad’s first time to Italy, and as beautiful as Genoa is, it’s not the highlight of an Italian tour. He had to see one of the big three (Venice, Florence and Rome). He also got some time to see the Milan train station, but more like in my previous journeys– unimpressed, worried about missing a train, and a bit rushed. I’m happy to say that Venice was just as magical and impressive, swarms of tourists and all. When Dad arrived last week, we spent an evening in Nervi (a typical Ligurian resort neighborhood minutes from my apartment). We then went to Acqui Terme for the weekend to indulge in mountain views, thermal waters, and quaint Medieval Architecture. The following day, Dad went off to Constance, Germany for more spas and lakeside views while I tackled the workweek. Thursday, I darted off after teaching four 80 minute long classes and met him in Milan as he was on his way back from Germany. I plopped into my train seat and gazed, dozed, and attempted to unwind while Dad caught up with all his stories from the past three days. We met up with young American girls, maybe backpacking for a weekend during Study Abroad, and they said the guidebook said you can buy them on the boat. We boarded, nobody asked, and we rode for free. Whoops. Gliding past buildings, peeking in windows, watching people stroll about, the city was magic at this time of night, empty, ours. We arrived at Ca’Doro, our neighborhood — and we were so delighted with our choice. 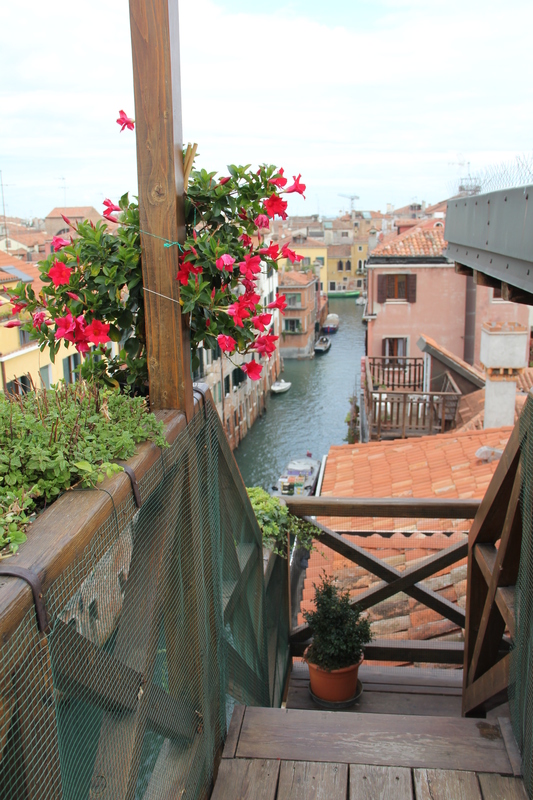 We chose a basic yet nice 3 Star hotel near the action, but not in it, nestled on a quiet canal. When we got to the hotel, after a magical walk through the streets, a neighborhood I’d never seen, I was shocked. It was literally on the canal. 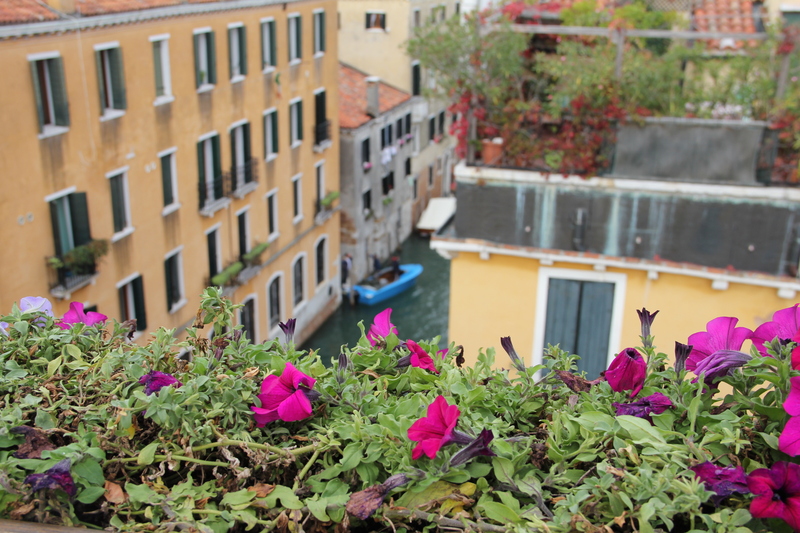 Up into the room, I peeked out the window and saw that we faced the canal with a stunning view — I couldn’t wait to see it in the morning. After 11pm, we were exhausted but we were here, ready for a nice long weekend of exploration and beauty. And as much as I love Genoa, I was happy to get away. 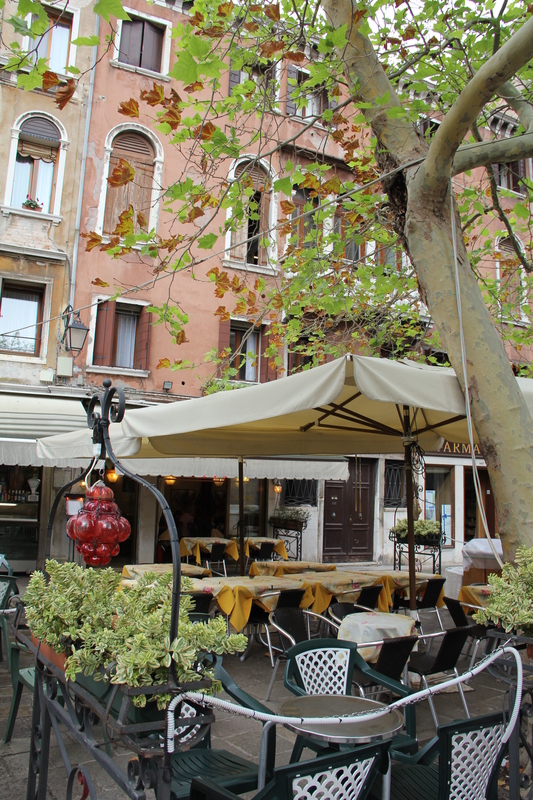 The next morning, we awoke to a basic but good continental breakfast in the dining area, then went out strolling and exploring Strada Nuova and all the shops. Shopping is surely good in Venice, perhaps better than Genoa, which is interesting because everything has to be carted in on boats then hand trucked to the stores. I had my eye on a few purses and clothes, but I was really here for the getaway and the beauty as well as spend time with my father — even though both of us were exhausted. Take it easy, enjoy. 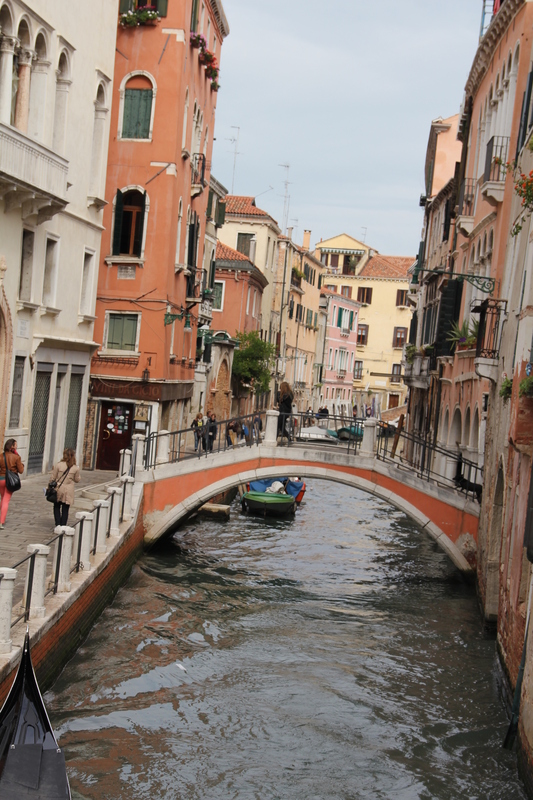 Friday, we did a lot of strolling about, to the Rialto Bridge and St. Mark’s Square, which was gratefully not yet flooded. 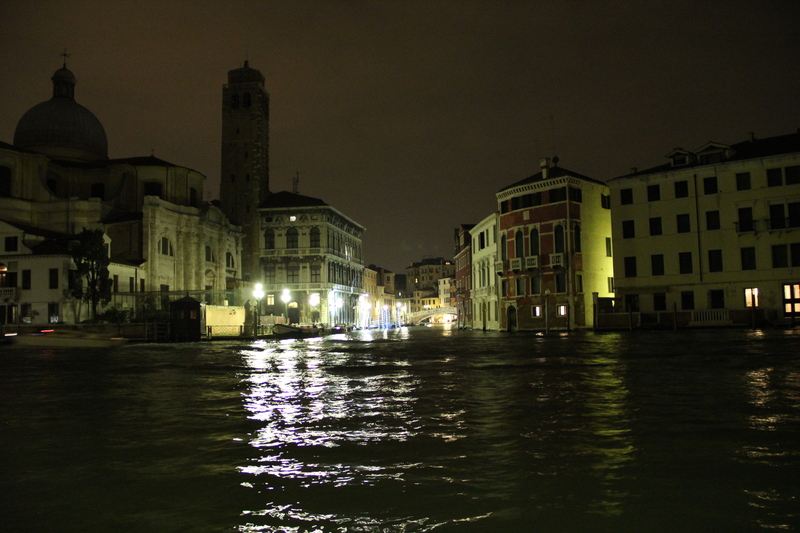 By Sunday, Acqua Alta had started to flood St. Mark’s Square as usual, and tourists had to walk on raised platforms. These platforms are set up all over the city, especially this time of year as the high tide season begins in October. Add this to the fact that Venice has sunken about 9 inches in 60 years, and we have quite a problem on our hands. I’m hoping they use the 7 euro bus fee to help subsidize the massive projects in place to protect the city. It’s quite fascinating, actually . . .they are building giant doors on the sea floor where the Adriatic spills into the canals of Venice, a city built on hundreds of little islands at the mouth of the Po River. When the tides get high, the doors will go up and prevent the water from rising. Sounds cool, like it could work in theory — but also quite dangerous if the city relies on this technology and it fails suddenly . . . 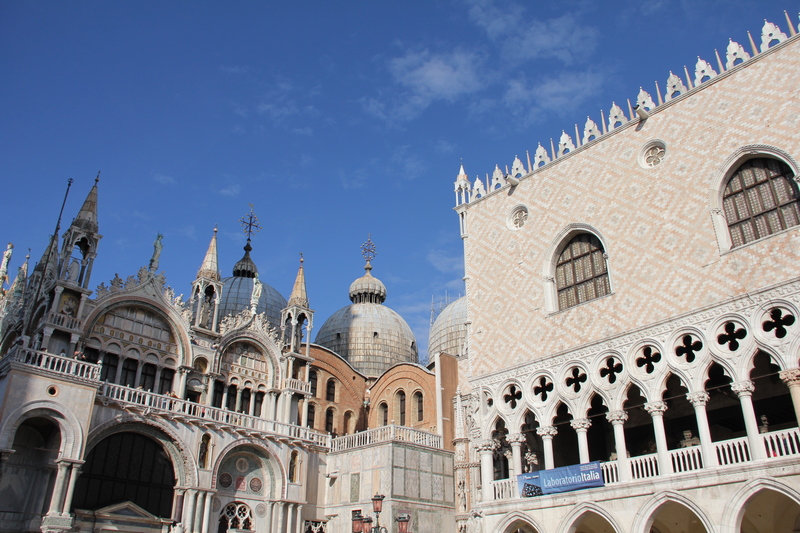 If not done properly, could a rush of water flood the city to the dome of St. Mark’s Basilica? It is quite amazing how well preserved this city is, given the age and the odds against it. “See Venice while you can!” they tell us tourists. And the tourists are coming, usually dumped in by the cruise ship load, in clusters of 3-4,000. 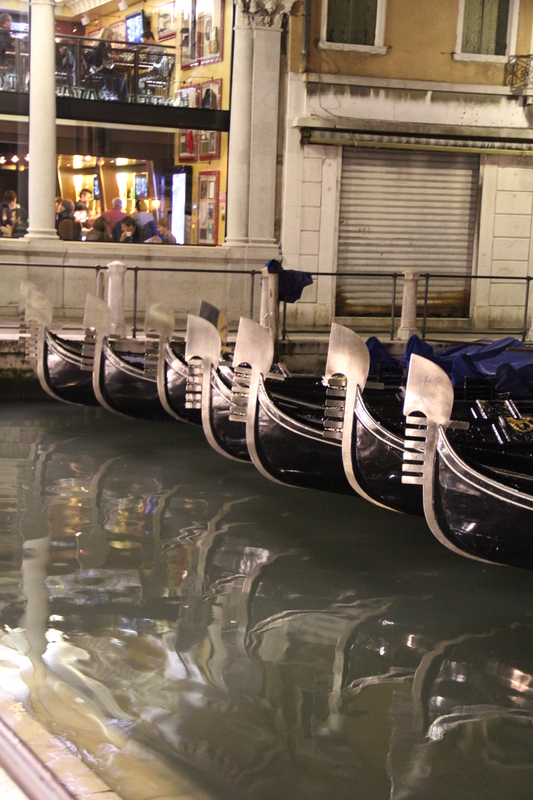 When these day trippers head back to their boats at night, only having glimpsed the most crushed, touristy parts of Venice, Rialto, St. Mark’s, the island of Murano for the glass . . . the city breathes again. The streets become magical, and you can wander freely and get lost in time. 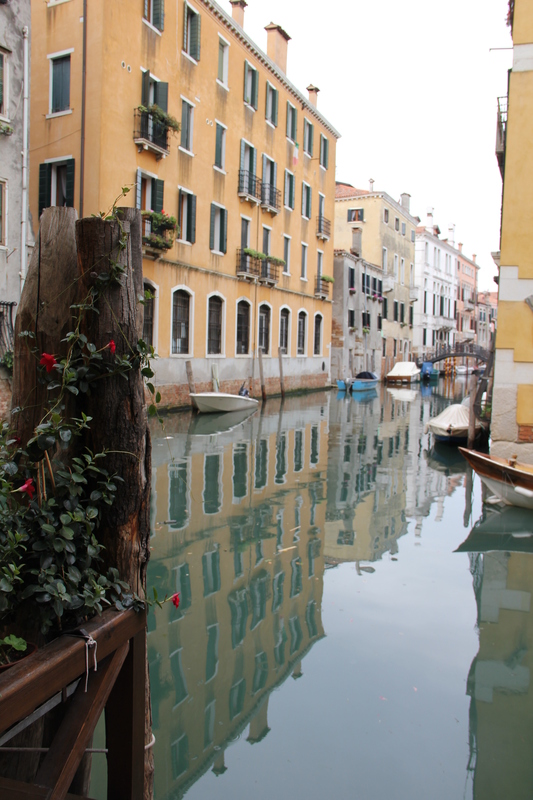 80% of the city is actually off the beaten tourist path, and if you take the time to wander just a little bit, you can enjoy the “real” Venice, when the ships are in port. 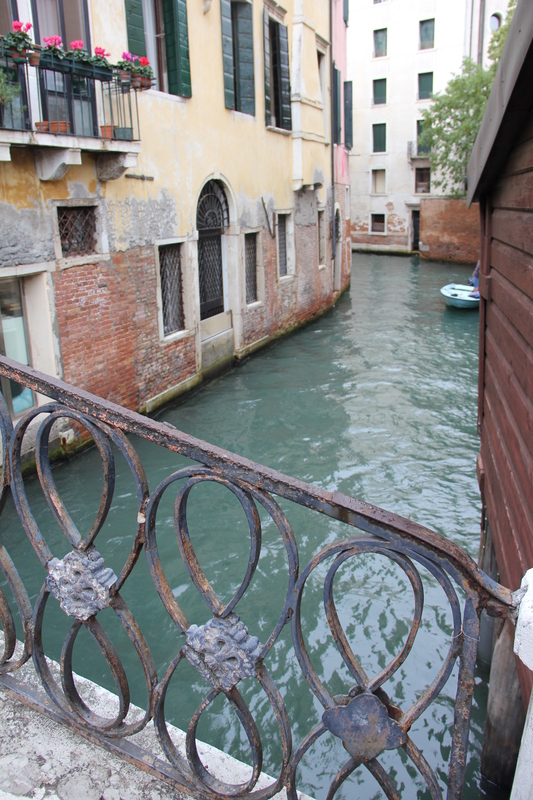 More about the real Venice and the magic of our visit. And I’ll show the new pictures soon, this time embedded in the story instead of the slideshow. Ciao for now. Off to dinner with Dad, his last night in Italy.